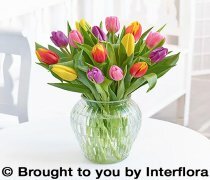 One of the most popular spring flowers, the tulip is a real symbol of the season. Widely available from December to April, these cheerful flowers never fail to brighten up the home, We love to use tulips in our Spring Collection each year and design bouquets and arrangements to celebrate their beauty. 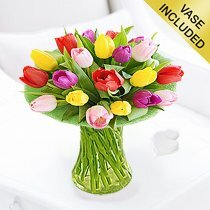 Choose a vase of mixed tulips for a simple yet very eye-catching arrangement, or one of the many mixed bouquets featuring tulips for a perfect seasonal gift to brighten someone's day..